Stations 56 and 28 were dispatched to a single vehicle MVC on Blackwell’s Mills Road near Canal Road. Rescue 56, Car 56, SO56 E562 responded with Engine 441, Car 44 Car 28 and Squad 28. Somerset members extricated one person who was heavily entrapped. The driver suffered serious non life-threatening injuries. The victim was transported to the hospital by RWJ medics and BLS. This complicated extrication took approximately 40 minutes to perform. Great work by all who responded. 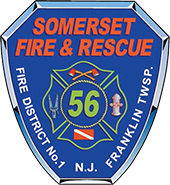 Somerset Fire & Rescue Co. No.1 divers were requested into the city of New Brunswick to assist them with the recovery of a vehicle that plunged onto the Raritan River along Rt. 18. Car 56, Car 562, Special Ops 56 with Marine Units 2 and 3, Van 56 and Rescue 56 responded. Somerset divers assisted with occupant removal and rigging for the tow truck to remove the vehicle. This incident is still under investigation. Our deepest condolences to all affected by this tragedy. Stations 56 and 44 were dispatched to an overturned single vehicle MVC with entrapment on Easton Avenue near Easton North Drive. Car 56 and Rescue 56 responded with Car 44 and E442. The driver of the vehicle suffered a medical emergency which caused the accident. The driver was extricated and died sometime later. The accident is still under investigation.